ANAS Presidium held the next meeting on March 6. Opening the event, ANAS President, academician Akif Alizadeh acquainted the participants with the issues on the agenda. He said that, the meeting is dedicated to the activities of the great representative of the Azerbaijani literature Samad Vurgun. Head of ANAS stressed that, the famous poet was a prominent scientist and patriot, his memory will always live in the hearts of people. The scientist also stressed that, being a poet of spring and a folk poet, Samad Vurgun devoted his whole life to humanity and patriotism. Then, Academician-Secretary of ANAS Division of Humanitarian Sciences, academician Teymur Karimli delivered a scientific report on “Ideology of Azerbaijanism in the works of Samad Vurgun”. 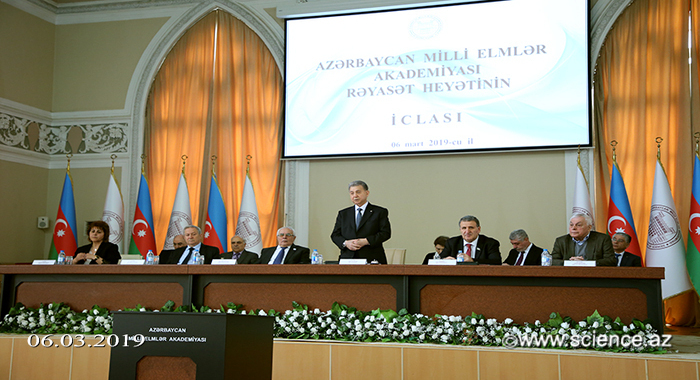 Academician said that, one of the leading ideological trends in the poetry of Samad Vurgun, which is a logical continuation of national national literary thought, drawing its content directly from the ethno-cultural potential of folklore thinking and characterized by deep lyricism and a system of human values, is Azerbaijanism. The scientist noted that the ideology of Azerbaijanism in the works of the classic was of exceptional importance during the Soviet period not only in terms of protecting national and moral values, but also functionally in terms of preserving the ideas of national statehood. Recalling that, at the celebration of the poet's 90th anniversary, national leader Heydar Aliyev noted that, the poetry of Samad Vurgun had enriched and developed the Azerbaijani language, Teymur Karimli added that, the great leader always highly appreciated the creativity of the classics. Recalling the Order of the President of the Republic of Azerbaijan Ilham Aliyev, successfully continuing the great leader’s policy, about holding the poet’s 100th anniversary at a high level, he noted that, this document is another evidence of the attention and care of the head of state about our literature and culture. The event adopted relevant resolutions in connection with the 110th anniversary of academician Hamid Arasli and the 90th anniversary of academician Asaf Nadirov. The meeting also adopted resolutions on amending the Decree of the Presidium of ANAS No. 11/4 dated June 29, 2018, creating a Department of Information and Public Relations in the Lankaran Regional Scientific Center of ANAS, making partial changes to the structures of the institutions of the Manuscripts after Muhammad Fuzuli and the ANAS Philosophy. In conclusion, was considered a personnel issue. Academician Ramiz Mammadov was approved as Director of ANAS Institute of Geography after academician Hasan Aliyev.